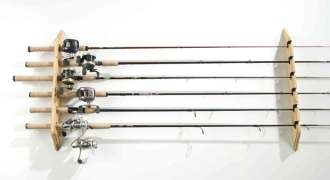 Organized Fishing Lacquered Pine Horizontal Wall Rack offers a convenient design that will save space and accommodate up to six rod and reel combinations. The solid pine looks great. You can rest assured that your rods will stay protected with the padded inserts.